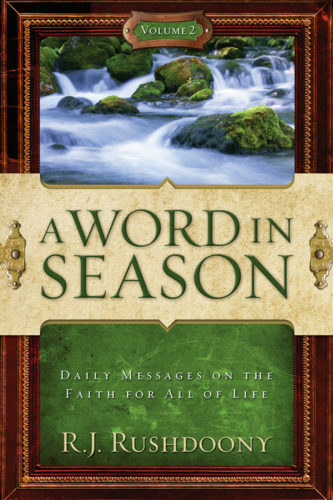 Although Dr. R. J. Rushdoony is most known for his scholarly works on theology, history, philosophy, economics, education, and statecraft, A Word in Season reveals the intense, but simple, approach to applying one's faith to every area of life and thought. This is all done in a format of bite-sized readings on the uncompromising faith. The multi-volume series is taken from over 430 articles written by Rushdoony over the span of 25 years (1966-1991) for the California Farmer, an agricultural periodical that provided him a regular column entitled "The Pastor's Pulpit." It has long been a desire of many to see these insightful and challenging articles published in a book format. We're happy to announce that the wait is over. Read and enjoy!